Summer means strawberries and strawberries mean either eat them as you pick them or make a torte. This is a personal favourite of mine and I associate this torte with family get-togethers and fun. It is easy to make and really light, in my opinion. Using fresh strawberries for this recipe is almost a must. Once again, this recipe comes from my mother and is a stable dessert in summer time for visits with the family and birthday parties. I think we had one at least every summer, if not more. It looks sophisticated but is not too difficult to make. Tip 1: The “cake setting ring” is needed so that the pudding and glaze stay in place and form the torte. My mother has such a ring made out of simple plastic. It is stable but bendable. The one she sent me is metal. I haven’t seen them yet over here but I guess you could find them online. You could also make one of your own, simple take a bendable piece of plastic and cut a strip. It should be about 10cm high or 4 inches. A biscuit cake is the base for the torte. The cake should be room temperature before you proceed. Place the “care setting ring” around the cake base and adjust it firmly so that nothing leaks and using a paper clip to secure it. Wash, core and cut the strawberries, preferably into halves depending on their size. Prepare the vanilla pudding according to the package. Dr. Oetker vanilla pudding is a good choice because it will be solid once it cooled down. The other puddings I have seen so far do not do that which will create a problem for cutting and eating. Mess anyone? Tip 2: Do not use as much (icing) sugar as the package indicates because I am a fan of “less sugar”. The pudding should be sweet but not overly so because strawberries, especially freshly from the garden, should have enough sugar by themselves. Also, the cake base has a sweetness to it. While the pudding is still hot, pour it on top of the cake. Place the strawberries on top of the pudding in any way you like. Press them slightly into the pudding and let everything cool for a while. Prepare the glaze according to the package and pour on top of the strawberries. 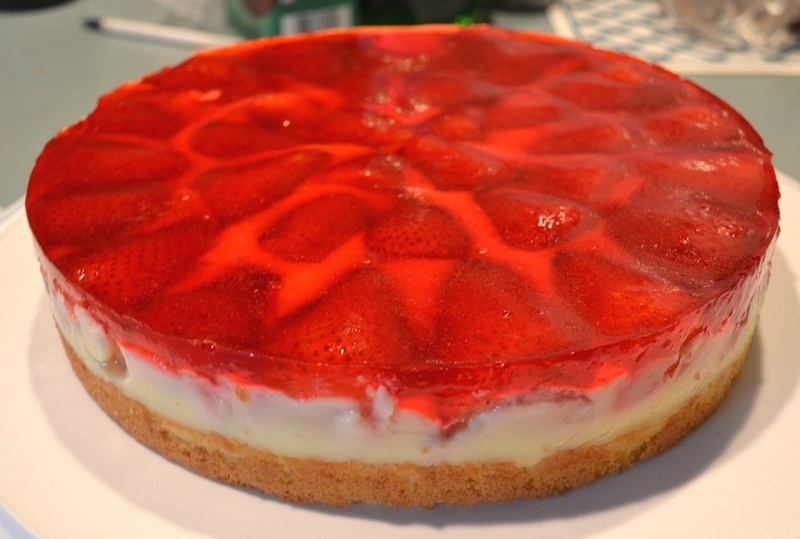 I prefer using the red glaze because that usually has a strawberries taste but you could use clear one as well. Either you leave the torte until it is cooled down or place it in the fridge to speed the cooling process. Once the torte is settled you can carefully remove the ring. You should use a sharp knife to cut around it to remove the ring easier. Finally, cut the torte into 12 pieces, either serve as is or add some whipping cream. Posted in Cake and tagged baking, German, pudding, recipe, strawberry, torte. Bookmark the permalink. Paul would love it! Looks delicious!